Posted December 9, 2013 by laurielmorrison & filed under Author Visits, Middle Grade Literature, Posts about author visits and Skypes, Teaching. Last Friday morning as I was having breakfast before school, I read this blog post entitled “The Paradoxical Extremes of Middle Grade Students: A Holiday Memory,” and I teared up a bit. In the post, Braden Bell, a choir director and author, describes his experience with a talented but silly group of eighth graders and the lovely, unexpected gift they gave him at a winter concert. It’s a touching post that you should definitely read, and Bell’s story captures the most frustrating and wonderful part of my job as a middle school teacher: the way middle school students can be goofy and rambunctious one moment and then amazingly thoughtful, mature, and—as Bell puts it—magnificent the next. When I read that blog post on Friday morning, I didn’t realize that I would get to experience a similar kind of moment, when students would surprise me with their compassion and interest, at school that very day. You see, it had been a long week for me and for the sixth and seventh grade students. They’d had a big day on Wednesday, when they’d presented major social studies projects during the day and again in the evening, and the weeks between Thanksgiving and winter break are always hectic with concerts and assemblies and general excitement. My friend, author Lyn Miller-Lachmann, was visiting my sixth and seventh grade classes on Friday, and I was nervous. We’d scheduled the visit for that day because Lyn was already going to be in the Philadelphia area for a bookstore event in the evening, but now it seemed like really bad timing. The sixth and seventh graders were tired and preoccupied. When I’d read them the first four chapters of Lyn’s middle-grade novel Rogue the day before and reminded them about the visit, they hadn’t seemed very enthusiastic. None of them had told me that they were coming to the optional Q and A I’d arranged during lunch, even when I said there would be candy. I wanted the students to be invested and energetic so that they’d really get something out of Lyn’s visit. I wanted Lyn to have a good experience at my school. I wanted to feel like the time and energy I’d put into planning the visit had been worth it. But as I headed to school on Friday, I thought I might be disappointed. When the sixth graders came in a little late from P.E., cutting short the already brief time they had with Lyn, I was discouraged. But then, sure enough, they participated in the discussion Lyn led and did a really nice job with her writing activity. 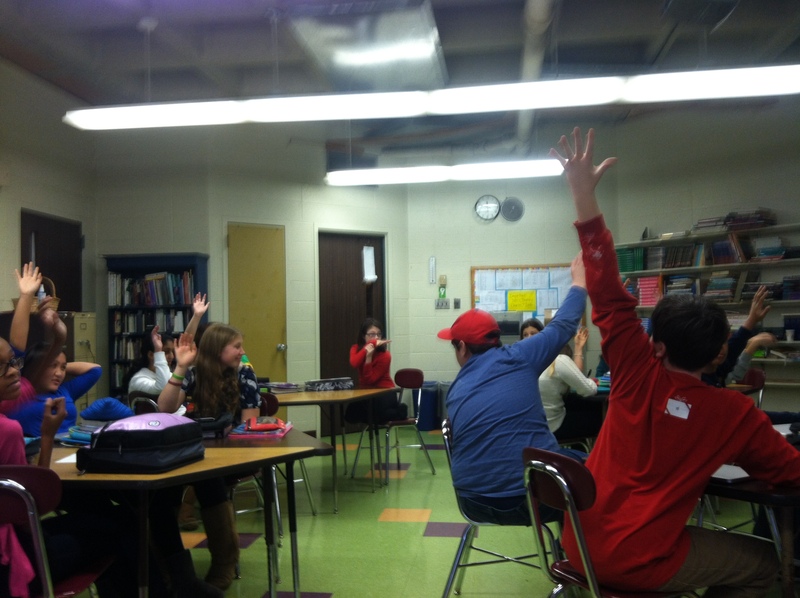 That was a relief…but the seventh graders were the ones who’d seemed especially exhausted. And there was still that lunchtime session. What if nobody showed up? 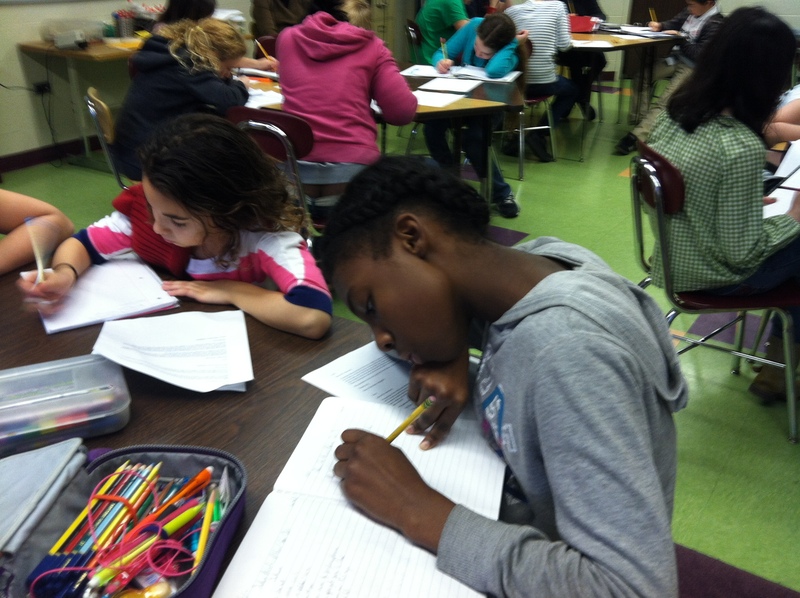 Sixth graders working on Lyn’s writing activity. And then something wonderful happened. The first class of seventh graders came in—this group of students who had barely reacted when I’d read them the first chapters of Rogue the day before—and one student put her hand up immediately to ask Lyn a question. After Lyn answered it, more students raised their hands. One student informed Lyn that he’d read the whole book the night before and that it’s awesome before asking her some great questions about which parts of the book are based on her own experiences. Lyn could barely even get to the writing activity because so many students wanted to ask questions and tell her about their experiences. Seventh graders eager to participate! I had to cut things off with that class so that Lyn and I could go down to the cafeteria to get lunch, and when we came back up to my classroom with our food, there were already a few students there. Phew, I thought. This is a respectable turnout. This is actually going okay. Then more students came in, so we pulled over another table, and then even more came in, so we added more chairs. Eventually, we had to start another table because we couldn’t fit everyone around the first two. And, okay, the students were eager to accept the candy I offered, but they were also eager to talk to Lyn! One tricky thing about teaching is that the outcomes often don’t feel like they match my input. There are times when I put a lot of work into planning a lesson or a field trip that feels like it flops, and that can be demoralizing. But last Friday reminded me that I don’t always know what students are getting out of what I am offering them. Sometimes they might seem checked out when they are actually very much checked in. And it’s worth it to try to give them experiences that I think will be meaningful because sometimes, they will throw themselves in and take more out of those experiences than I could have hoped. Thank you, Laurie! I had a wonderful time and was really impressed by the students, their writing, and their questions. And, yes, the lunch was so packed with enthusiastic kids that some of the latecomers didn’t get the chance to speak to me in person. I felt bad about that, but since the latecomers were mostly eighth graders, perhaps I can return to speak to their ninth grade social studies classes next year about Gringolandia. It was a thrill to hear from the boy who bought the ebook, read it overnight, and recommended it to the rest of the class. I’m so glad you enjoyed the day, Lyn, and I agree–that moment was a thrill for me, too! Oh, Laurie!! What an awesome and honest post. I can totally understand how discouraged you felt. I’m so glad your students were so eager to talk with Lyn. Glad her visit was great. What a wonderful post! I really enjoyed reading that. The contours of it seem so familiar even though the details are different. What strange and wonderful creatures these middle school students are. Thank you for sharing this. Thanks so much for reading, Braden! I agree–strange and wonderful, indeed!